Fits LC9 fine. 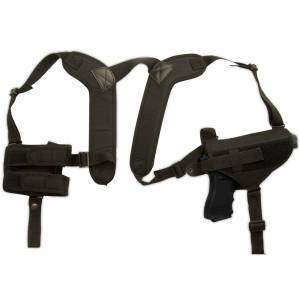 Rig is easily adjustable and I’m fat.I’ve had rigs all my life (72) and this rates one of the best. Nice price point too. Leather quality is better than the price might imply. I’m very satisfied. Overall the quality is decent. Easy to adjust. But its a little bulky under a jacket, so I suggest tailoring a bit larger. It does not hug the body as much as I would prefer either. The magazine holder also did not fit my mags that easy and it took some work to get them to fit. Husband loves it, great deal for a quality item! 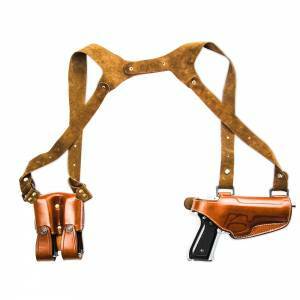 I Have Seen And Felt Many Shoulder Holster's. When I ordered This One I Had No Thought (For The Money) That It Would Fit My Needs As Well As “It” Does. Comfort,Quality,& Cost. 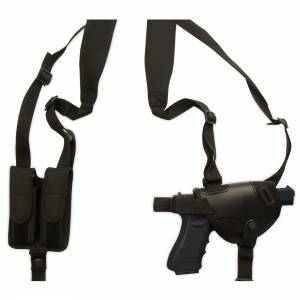 It Is A Great Value As Far As I See, And Would Recommend It For Any One Who Is Thinking, (Shoulder Holster)! Very comfortable. 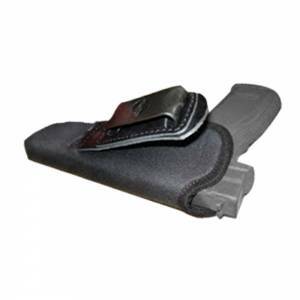 This is perfect for the Glock 26. 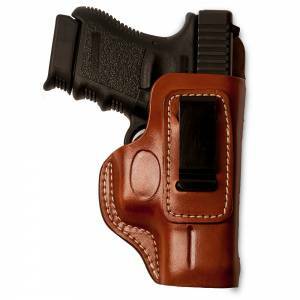 It is cooler outside right now and this has become my favorite holster; will probably use hip holster in the summer. I typically wear a light sleeveless vest/jacket over it and it hides it very well. 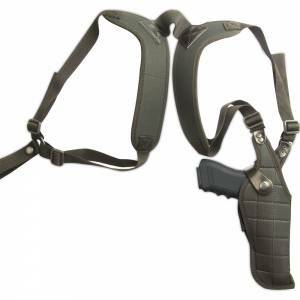 I wasnt sure how comfortable it would be but as i stated above it hangs perfectly – after i adjusted the size to fit me. 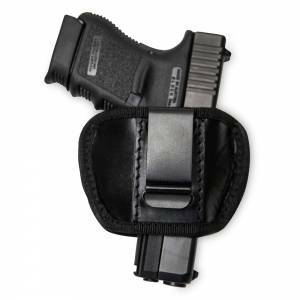 Thinking about getting one for my Glock 21 but the 2- might be too heavy and bulky to work as well as this holster does with the 26. Fits my Sig 1911 perfectly. I'm 6'3″ and long in the torso so at full extention it's a hair shorter than I'd like it to be but that's part of being built like shrek. 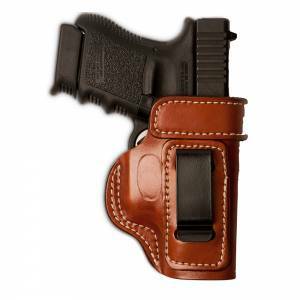 I would recommend it if you're looking for a quality holster at a good price. 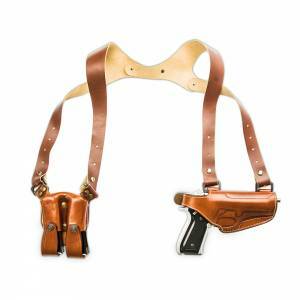 I ordered this for my Ruger pistols. It fits like a glove and is comfortable to wear. Will be used fall winter and spring . Impressed for price with the quality . 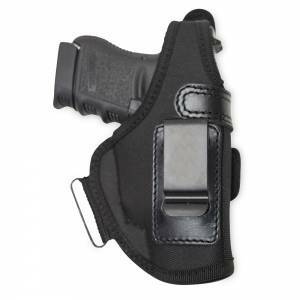 Recommend it if you don't want to spend hundreds on one ..
Great quality, fit SR9 perfectly. Well made and wears well. 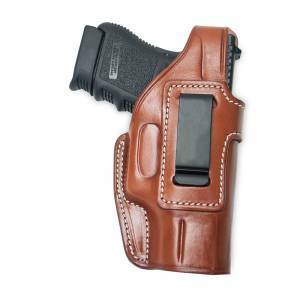 This is a premium holster. 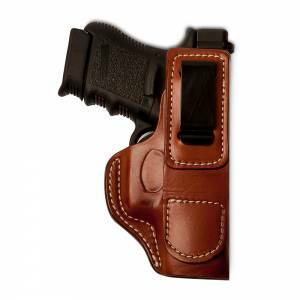 The color is great and the finish is good with high quality leather. This product turned out to be much better than expected. This was a “best buy”. Just received this product. Saw all the YouTube vids but ordered anyway. Seems that they listened to every complaint and fixed every problem the old videos pointed out. 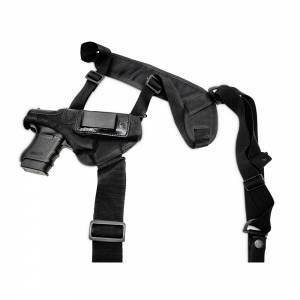 This shoulder holster is very comfortable now and it only took me 10 min to adjust for me. I am 6'3″ 350 lbs and it is nice. 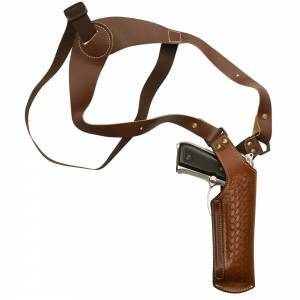 Carrying a Browning hi power 9mm and I am comfortable wearing this everyday. 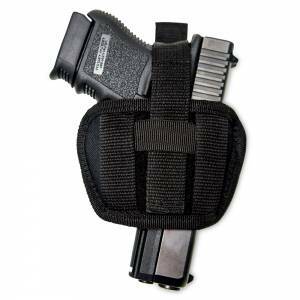 Great holster for a big guy not wanting to carry iwd everyday. 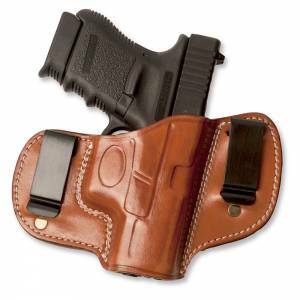 • Fits almost all medium-large frame semi-auto handguns including Desert Eagles. 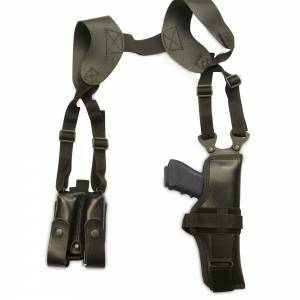 • Two retention straps for various size pistols. 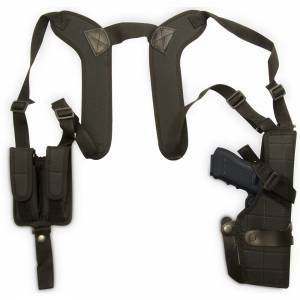 • THREE HOLSTER IN ONE! 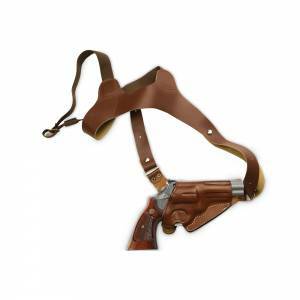 • Fits popular semi-autos and revolvers. • Ambidextrous, left or right handed. 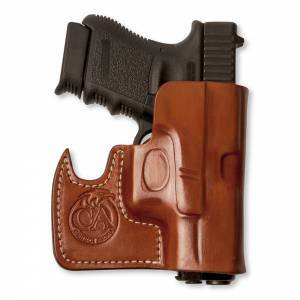 of the back iwb or vice versa. 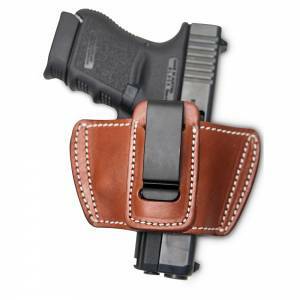 My first tuckable holster and I am impressed. 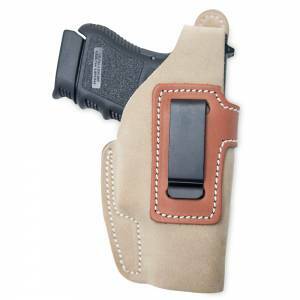 Great holster for the low money. Is made for a normal Right Handed person. I like being able to tuck shirts for work and this allows that. 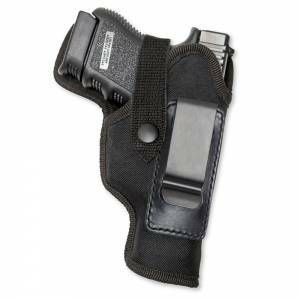 My edc is a Ruger LCP .380. 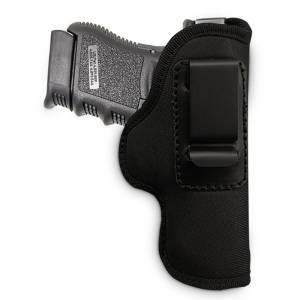 Fits my Taurus .380 perfectly, being tuckable makes it even more easy to conceal. 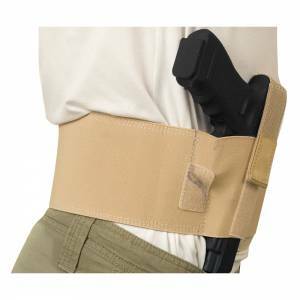 Nice and thin, strong belt clip. Was perfect for summertime carry. Very low profile. Very comfortable. 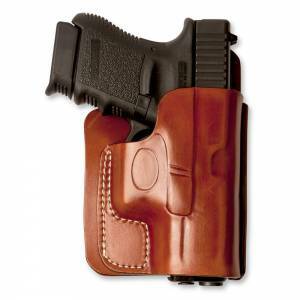 great for concealed carry. 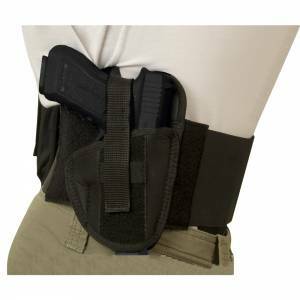 • For concealed carry, inside-the-pants wear.